New York: Penguin Group, 1995. This is the first paperback printing of Writing the Southwest. 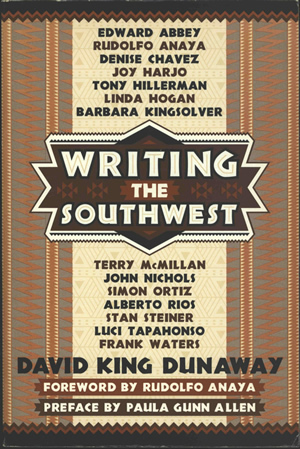 The book is based on the radio documentary series "Writing the Southwest" written and produced by David King Dunaway, a professor of English at the University of New Mexico, who also is the author of this book along with Sara L. Spurgeon. The book is a print version of audio interviews carried out with many well-known writers, including Tony Hillerman and has a foreward by Rudolfo Anaya and a preface by Paula Gunn Allen. The front cover of the book has a background of vertical zig-zag patterns in orange and grey. Top and bottom borders are horizontal zig-zag patterns in reddish brown and black. The book title is printed in white, in block printing, within a central geometric emblem. A list of names of authors interviewed extends above and below the title emblem. The author's name is at the bottom in black print. The horizontal top and bottom borders continue around the spine and onto the back cover, which has a tan background with an opacified triangular design. Printed in black is a description of the book. The price and bar code are at the bottom of the back cover. Binding: Paper covers. The publisher's imprint, book title, first aurhor's name, ISBN and literature designation are printed on the spine.